Why become a Child of Africa partner? 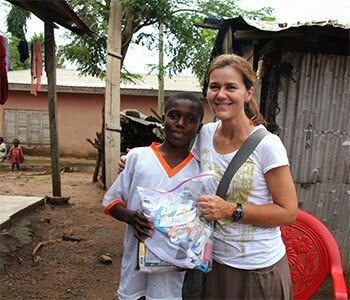 Our efforts to fund our programs in Ghana depend on generous donors. If you believe in our mission to educate, transform, and restore the most at-risk children and their families in Ghana, then we hope you’ll consider partnering with us. ACEF uses very little donation dollars for operating expenses, but instead uses partnership donations to supplement our projects: Laptops for Learning, Women’s Sustainability, Girl Child Education Club, and Sponsorship. What are the options for partnership giving? $25 – Efie (Home) Partners receive the monthly newsletter and annual summary, which tells the stories of how lives have been impacted during the year through ACEF work. $100 – Wiase (World) Partners receive the monthly newsletter, annual summary, artwork from a child, and a video greeting from Ghana.